Very knowledgeable Doctor. He laid out options for my shoulder injury and didn't sugar coat anything. Dr. Shah was very patient and pleasant. He noticed right away that I had another problem aside from what my appointmentwas for and recommended two doctors. Will definitely be back if needed. Dr. Shah was very patient and pleasant. He noticed right away that I had another problem aside from what my appointment was for and recommended two doctors. Will definitely be backif needed. **Please be advised: Dr. Shah specializes in shoulder and knee conditions. Please only book an appointment with him if you need care for your shoulder or knee. Thank you. 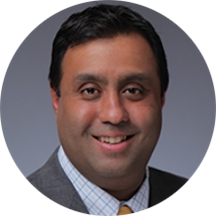 ** Mehul R. Shah, MD is an Assistant Professor of Orthopaedic Surgery at the New York University-Hospital of Joint Diseases. He is a board certified, fellowship trained orthopaedic surgeon. Dr. Shah specializes in the orthopaedic care of sports related injuries as well as arthroscopic and reconstructive surgery of the shoulder, knee, and ankle. A graduate of the Johns Hopkins University and the Mount Sinai School of Medicine, Dr. Shah completed his residency in orthopaedic surgery at the prestigious NYU Hospital for Joint Diseases. He then received further training in advanced arthroscopic and reconstructive surgery at the renowned Lenox Hill Hospital Sports Medicine fellowship. During his fellowship training, Dr. Shah participated in the orthopaedic care of the New York Jets, New York Islanders, Hofstra University, and Hunter College. Dr. Shah's clinical interests include meniscal sugery, ligamentous reconstruction of the knee, cartilage restoration procedures, and rotator cuff repair. I would highly recommend Dr. Shah. Really nice guy and thorough! Quick wait time and excellent staff. Very tentative and caring doctor that answered all questions I had. Was adamant about my health concern and started tests/treatment right away. Arrived early for the appointment, taken right away. Dr. Shah's nurse was efficient and very nice, and the doctor himself was a breath of fresh air, down to earth, spoke to me like the thinking person I am and not anumber. He sent me for x-rays right then for a knee problem, sat and talked with me afterwards about all my options, advised me on health issues involved with each option, and recommended surgeons on staff for the point in time when I decide I can schedule the knee replacement. I was in and out in under an hour, an efficient staff at every step. I was extremely satisfied with my appointment with Dr. Shah. He did not rush me, he really took the time to understand my issues and concerns, and made me feel extremely comfortable. I highly recommend Dr. Shah. Friendly. Answered all my questions. Dr. Shah was excellent - good bedside manner, very clear explanation of my issue, and a solid plan for how to treat it and follow up. Plus the staff were terrific and i barely sat down for 10 seconds before they called me in. Wonderful office. Highly recommended. My first appointment was a consultation for chronic shoulder pain — they performed an x-ray and referred me to get an MRI. I'm not 100% sure of the diagnosis yet, but Dr. Shah heard my concerns and didn't rush to any conclusions. The receptionist was wonderful and the wait time was shorter than 30 minutes. Dr. Shah is quick yet efficient. He makes sure to understand the problem or concern. He was very good. Knew what he was talking about. Only waited a few minutes. I would definitely recommend him. Incredibly long wait. I liked Dr. Shah but the NYU infrastructure meant that I was there for 2 hours for a consultation and XRay. Absurd. Dr. Shah was so nice! I felt comfortable talking to him about my shoulder and he explained everything to me very clearly! He prescribed physical therapy so hopefully that will help! Overall great experience working with Dr. Shah! I came in to see Dr. Shah because I have been having knee problems which I believe have stemmed from running. I did not have to wait at all, they took me in right away! After the nurse looked at me,Dr. Shah came in right after. He was quick but thorough with my diagnosis, and told me that he did not think I needed x-rays, which was great because he did not try to sell me something that would have cost me a lot more. He then spent a lot of time answering any and all questions I had, and gave me cost-effective suggestions for treatment. Would highly recommend! Took my teenager to Dr. Shah. He was wonderful!!! This may have been one of the most efficient and enjoyable doctor visits ever for me. The team and processes at NYU Langone are so organized that I was able to see the doctor, get an x-ray and have it reviewedall within an hour. Not to mention Dr. Shah was wonderful to work with. I appreciated his attention to detail and his consideration to getting my poor knee the help it needs. I will happily be visiting again. Doctor was great; knew what he was talking about, good bedside manner. Would highly recommend, only issue was I spent a lot of time being ushered between waiting rooms. Good bedside manner but comes to a diagnosis almost too quickly without providing much input on causes of the condition, time to recovery, etc. In prior visits I have not had an opportunity to complete listing my symptoms before Dr. Shahhas already made a diagnosis. Turnaround is typically under two or three minutes which seems almost too quick. I've trusted Dr. Shah my knee and shoulder and have no complaints! Dr. Shah is everything a doctor should be. My husband had surgery on his shoulder with Dr. Shah in December and we have been so impressed with the care and compassion we have received. The office is fantastic and Dr. Shahis personable, compassionate, he takes his time, and he's a great listener. He's also very conservative about the decision to have surgery - which we appreciate. He had us try every other solution before resorting to surgery. Can't say enough good things about Dr. Shah! Very professional, as always. Be sure to ask questions when you are with the doc as he didn't tell me what to do about the pain until I asked later, after leaving his office. Dr. Shah is very good but as with most doctors in NYC, very quick in turning patients around. He takes a quick assessment, just says what the issue is and that's it. It would be great if he took the timeto tell you what may have caused the issue and general avoidance or explain the issue in more detail. But other than that, he appears competent and has a good bedside manner. He seemed very knowledgeable and gave me alternatives to surgery which i liked. Dr. Shah was very personable and easy to talk to. I appreciated the time he took to speak with me. He was encouraging about my recovery progress and also gave me a clear view of how to manage my expectations goingforward. I'd highly recommend him to anyone looking for an orthopedist in the New York City area. Not only Dr. Shah but the entire NYU facility and the entire staff were amazing. SO efficient and kind. I can HIGHLY recommend. Wait time was long, and they weren't able to use the forms that I filled out through Zocdoc. But very professional and high end looking place. People are friendly. Very professional, and honest. Trustworthy and gave me options, and I would highly recommend. Excellent. Knowledgeable, easy to talk to. I appreciated his sending me for x-ray's (two floors up in the same bldg) and his recommendations based on my lifestyle and activity level. I was very impressed with the high level of professionalism and expertise that I experienced from Dr. Shah and his staff during my initial visit. Great doctor, helped me comeback after a running stress fracture. We have been seeing Dr. Shah for almost 2 years and are continually impressed with the efficiency of the office, the quality of his care, and his compassion. Very willing to take his time and help educate. Great doctor. This medical organization has the most efficient system for patients I've ever seen. So far so good. I have a follow up visit. for now, I would highly recommend this office. Dr. Shah was attentive and knowledgeable. Dr. Shah was very pleasant and professional, dealt with my medical issues and sent me for all the necessary testing. Surgery wasn't needed and I appreciated his honesty and conservative approach to treatment. I thought he was really good. And he made me laugh. Two thumbs up.